Valerie Lagrange was born in Paris on February 25, 1942. During her teens she started auditioning for acting roles, which resulted in her appearing in various French films. In 1964 she released her first single, a double A-side featuring the songs 'Paris-Wellington' and 'La nuit de mon amour'. 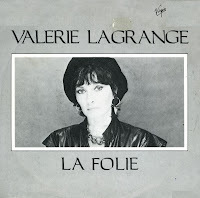 Many singles and albums later, Valerie released 'La folie' in 1984. It was taken from her album 'Les trottoirs de l’éternité'. It was a big hit in French-speaking countries, and also nearly made the Dutch Top 40. This is how I caught on to this song: it was regularly played on the radio and on one occasion I recorded it. Seven years later, I got hold of the single. It's still an alltime favourite of mine.